In Turkey, the national dairy company Sütaş dismissed 83 workers in 2013 after they joined the IUF-affiliated Tekgıda-İş union in 2 factories in Bursa-Karacabey and Istanbul-Aksaray. Many other workers were harassed and forced to resign their union membership through intimidatory tactics which included the company making contact with workers families. Other workers have been dismissed for posting comments critical of the company on social media. Dismissed workers together with their families picketed at the factory gate. When the dismissed workers refused to disperse, the management poured 13 tons of liquid manure on the sit-in area. While this was intended to end the picket and disperse the protesters, it attracted flies onto the dairy plant and compromised food safety. Eventually management had to clean up the area and disinfect the surrounding villages. The courts decided that workers were unfairly dismissed for union activities and ordered their reinstatement. 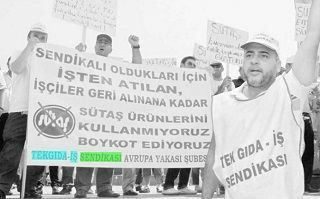 Tekgıda-İş launched a campaign in support of this verdict calling on consumers to buy other than Sütaş products until all the dismissed workers are reinstated. Sütaş filed a lawsuit against Tekgıda-İş claiming that the boycott call was causing unfair competition for the company. The court determined that the language used in the campaign material was based on the concrete facts about the unfairly dismissed workers and therefore should be considered as freedom of expression not unfair competition. For a country ranked 149 out in 180 countries in the 2015 World Press Freedom Index, this case will set a progressive precedent for future union activities in Turkey.